Pharma Marketing Blog: For Pharma Marketers, Celebrities + "Social Media" = Gold Mine! For Pharma Marketers, Celebrities + "Social Media" = Gold Mine! Today, I learned from a @Novartis tweet that yet another celebrity is teaming up with a pharmaceutical company to leverage "social media" for marketing purposes. The celebrity is singer and LGBT rights activist Cyndi Lauper, who admits she she has "moderate-to-severe plaque psoriasis (PsO)." 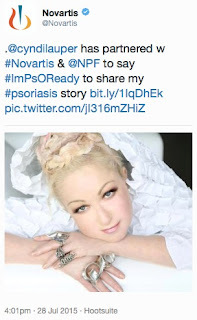 Lauper is featured on the "THAT's PsO ME" website hosted by Novartis in conjunction with the National Psoriasis Foundation. Novartis recently won approval from FDA to market Cosentyx (secukinumab) for the treatment of moderate-to-severe plaque psoriasis in adult patients. In a PEOPLE magazine article published yesterday, Lauper reminds us that "It's not just a rash. It's a disease" -- a statement straight out of the pharma marketer's playbook. Of course, like many other aged celebrities hired by pharma (e.g., Monica Seles admitted she suffered from binge eating disorder for many years; she too came out in PEOPLE magazine after signed on with a pharma company; read more about that here), Lauper suffered from her condition in secret for many years before being paid by pharma to come out in the open. "You don't have to suffer in silence or live in pain," says Lauper after doing just that for years. 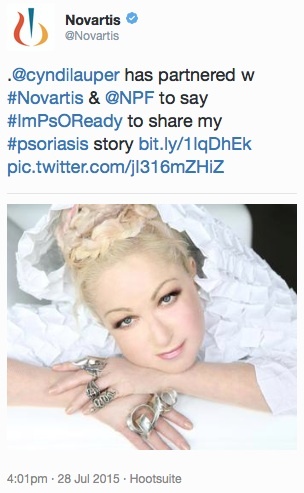 Not only is Lauper shilling for pharma in PEOPLE magazine, she also "joined" the THAT's PsO ME "community." What's that all about? The website encourages registered visitors to "Help spread the reality by sharing [their] personal psoriasis experience[s]." It appears that a number of users have already done so (see Megan's comments on left). 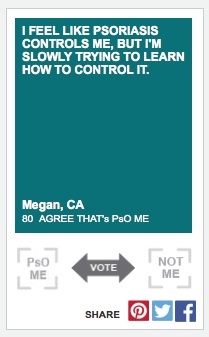 You can vote whether you agree or disagree if Megan's story is "PsO" you or not "PsO" you. This reminds me of Pfizer's old "Get Old" website, which was, in 2012, a "first-of-its-kind online community" where people can "get and share information, add to the dialogue and contribute to the growing body of knowledge about this important topic," according to the Pfizer press release (read "Pfizer's Social Media Initiatives are Getting Old"). Novartis learned from Pfizer that this kind of "faux" social media site (where no real dialogue occurs) is a gold mine for marketers. Instead of doing painstaking and expensive market research (e.g., focus groups), Novartis, like Pfizer, can collect real patient stories and experiences for FREE via an online "community." Not only that, you have to register, provide your email and postal address, and agree to receive marketing information from Novartis before you can share your "personal psoriasis experience." And Novartis can get an idea of which stories resonant with registered users who can share the stories on Facebook, Pinterest, and Twitter. So, I joined and submitted this: "My psoriasis flareups prevent me from "rolling up my sleeves" at business workshops. I always look too formal! :("
THANKS FOR SHARING Your submission is being reviewed. This may take some time, but we’ll be sure to let you know when it’s live so you can continue to spread the word by sharing on your social networks. Please know we may not be able to post part or all of your message — but we're still listening! To help ensure your message gets posted, please read our guidelines before proceeding: Do not include medical advice Do not use profane, indecent, or inappropriate language in your message Do not use your last name and/or e-mail address in your message, so this personal information remains private and protected Do not include spam, such as links to, or URLs for, other websites or social networks in your message Please note that in order to comply with our guidelines as well as the FDA's Prescription Drug Advertising Guidelines, your statement may be subject to modification, while maintaining the spirit of your message. Your statement may be used in other Novartis marketing materials. How much value do celebrities add to this process? Obviously, no plain Jane with psoriasis is going to be featured in PEOPLE magazine for admitting she silently suffered from the condition for years and is now speaking out about it. And no plain Jane has as many Twitter/social media followers as Cindy Lauper, who has over 280,000 Twitter followers (that's all?). So, celebrities can jump start a campaign. But it's unlikely that we will ever see Cindy responding to plain Janes who submit their psoriasis experiences to the THAT's PsO ME "community." After all, like so many pharma social media activities, it's not really a community, it's a combination market research tool and marketing campaign.